The light-second is a unit of length useful in astronomy, telecommunications and relativistic physics. It is defined as the distance that light travels in free space in one second, and is equal to exactly 299,792,458 metres (983,571,056 ft). Just as the second forms the basis for other units of time, the light-second can form the basis for other units of length, ranging from the light-nanosecond (299.8 mm or just under one international foot) to the light-minute, light-hour and light-day, which are sometimes used in popular science publications. The more commonly used light-year is also presently defined to be equal to precisely 7007315576000000000♠31557600 light-seconds, since the definition of a year is based on a Julian year (not Gregorian year) of exactly 365.25 days, each of exactly 7004864000000000000♠86400 SI seconds. Communications signals on Earth rarely travel at precisely the speed of light in free space. Distances in fractions of a light-second are useful for planning telecommunications networks. One light-nanosecond is almost 300 millimetres (299.8 mm, 5 mm less than one foot), which limits the speed of data transfer between different parts of a large computer. One light-microsecond is about 300 metres. The mean distance, over land, between opposite sides of the Earth is 66.8 light-milliseconds. Communications satellites are typically 1.337 light-milliseconds (low earth orbit) to 119.4 light-milliseconds (geostationary orbit) from the surface of the Earth. Hence there will always be a delay of at least a quarter of a second in a communication via geostationary satellite (119.4ms times 2); this delay is just perceptible in a transoceanic telephone conversation routed by satellite. The answer will also be delayed with a quarter of a second and this is clearly noticeable during interviews or discussions on TV when sent over satellite. The yellow shell indicating one light-day distance from the Sun compares in size with the positions of Voyager 1 and Pioneer 10 (red and green arrows respectively). It is larger than the heliosphere's termination shock (blue shell) but smaller than Comet Hale-Bopp's orbit (faint orange ellipse below). Click on the image for a larger view and links to other scales. The faint yellow sphere centred on the Sun has a radius of one light-minute. 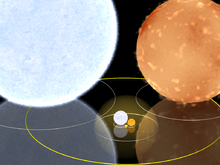 For comparison, sizes of Rigel (the blue star in the top left) and Aldebaran (the red star in the top right) are shown to scale. The large yellow ellipse represents Mercury's orbit. The light-second is a convenient unit for measuring distances in the inner Solar System, since it corresponds very closely to the radiometric data used to determine them. (The match is not exact for an Earth-based observer because of a very small correction for the effects of relativity.) The value of the astronomical unit (roughly the distance between Earth and the Sun) in light-seconds is a fundamental measurement for the calculation of modern ephemerides (tables of planetary positions). It is usually quoted as "light-time for unit distance" in tables of astronomical constants, and its currently accepted value is 499.004786385(20) s.
The mean diameter of Earth is about 0.0425 light-second. The average distance between Earth and the Moon is about 1.282 light-seconds. The diameter of the Sun is about 4.643 light-seconds. The average distance between Earth and the Sun is 499.0 light-seconds. Multiples of the light-second can be defined, although apart from the light-year, they are more used in popular science publications than in research works. For example, a light-minute is 60 light-seconds, and the average distance between Earth and the Sun is 8.317 light-minutes. ^ Standish, E. M. (1998). "JPL Planetary and Lunar Ephemerides, DE405/LE405" (PDF). JPL IOM 312.F-98-048. Archived from the original (PDF) on 2012-02-20. . This page was last edited on 21 February 2019, at 09:49 (UTC).